With rock and roll now well over 50 years young, and progressive rock having notched an impressive four decades, there can be a feeling of over familiarity where one record seems to sound quite a lot like another, with none particularly standing out as anything special. This could be particularly true of the neo-progressive scene, with a whole lot of bands sounding like they want to be the next Dream Theater. How refreshing then, to come across this great new slice of progressive rock from Argentinean band Poseidotica. Hailing from Buenos Aires, this all-instrumental band formed in 2001, and released their debut “Intramundo” four years later. 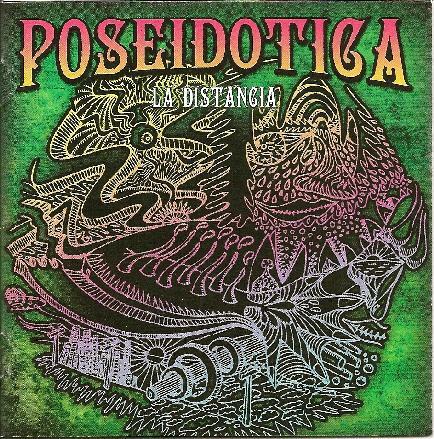 With their follow-up disc “La Distancia” hot off the press, Posedotica (no translation available at time of writing) have released one of the best rock albums so far for 2008. Unusually for a non-vocal project, “La Distancia” is a concept album, based around different interpersonal human relationships (although this may not be readily apparent to monolingual English speakers such as myself, since the 20 page booklet is completely in Spanish). The title track opens with a circular guitar picking groove reminiscent of Ozric Tentacles, before heading off in a direction that makes full use of the dual guitar format. Strangely enough, this and other cuts remain remarkably uncluttered, giving the sense that they could easily have vocals dubbed in over the top if required. Thus there is little actual jamming on “La Distancia” (both track and album), but rather a carefully constructed song cycle. The band have no credited keyboard player, the complex and intriguing soundscapes being rendered largely on guitar. This is particularly evident on “Equinoccio”, an atmospheric piece featuring heavily treated guitar (some of which appears to be reverse-tracked) and cymbal crashes to paint a dark picture reminiscent of Joe Satriani’s “Hill Of the Skull”. The final track, “Las Magnitudes”, is a genuine progressive rock epic which stretches to a mesmerising fifteen minutes, without once overstaying its welcome. The many different moods include the same metal rifferey which burns through earlier pieces, followed a quieter volume-swell guitar segment, before bursting into a speed metal climax, which comes to a sudden and slightly jarring finish, a fitting grand finale for this excellent slice of neo-progressive rock. Quite simply, this album is just awesome, and should be sought out by discerning fans of progressive rock and metal. For more information you can visit the Poseidotica web site at: http://www.poseidotica.com.ar. Hear their music at: http://www.myspace.com/poseidotica. Visit the Aquatalan Records web site at: http://www.aquatalanrecords.com.ar. Email at: info@poseidotica.com.ar.